In this photo taken Saturday, Feb. 6, 2010, a sign announcing the acceptance of electronic Benefit Transfer cards is seen at a farmers market in Roseville, Calif.
Access to the food stamp system was restored late Saturday following a computer failure that knocked out service to people across 17 states, preventing some from buying groceries. 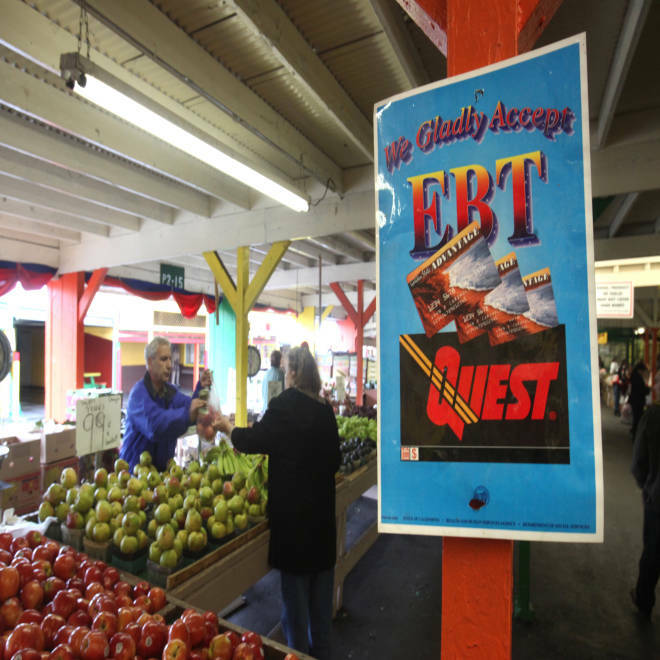 "Beneficiary access to programs such as SNAP, TANF and other programs has been restored to the 17 states where Xerox provides EBT service," said a statement from vendor Xerox Corp, which manages the electronic benefits transfer cards. "Re-starting the EBT system required time to ensure service was back at full functionality." The company apologized for the disruption, adding: "We realize that access to these benefits is important to families in the states we serve. We continue to investigate the cause of the issue so we can take steps to ensure a similar interruption does not re-occur." Ohio, Michigan, Illinois and California were a few of the states where people reported having trouble using their food stamp cards Saturday. A company spokeswoman confirmed Saturday afternoon that the system experienced connectivity issues. "During a routine test of our back-up systems Saturday morning, Xerox's Electronic Benefits Transfer (EBT) system experienced a temporary shutdown. While the system is now up and running, beneficiaries in the 17 affected states continue to experience connectivity issues to access their benefits," spokeswoman Karen Arena said in a statement. Officials had advised beneficiaries to use the manual system in the meantime, which meant SNAP customers could spend up to $50 until the system is back online. Eliza Shook, a cashier in Clarksdale, Miss., one of the country's poorest states, told The Associated Press dozens of customers at the grocery store where she works had to put back the groceries when their cards didn't work because they couldn't pay for their purchases otherwise. "It's been terrible," Shook told the AP. "It's just been some angry folks. That's what a lot of folks depend on." A representative for the U.S. Department of Agriculture, which manages the SNAP program, said the service disruption was not related to the government shutdown.